We offer six, 1-week session for campers aged 6 to 16. 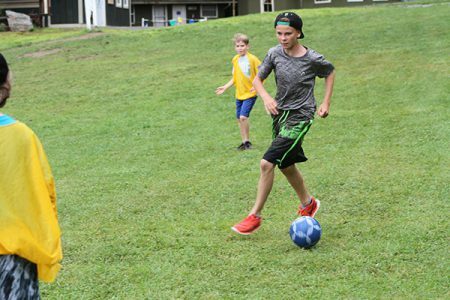 During their stay at camp, campers get to experience a wide range of activities in a safe and positive environment. Traveling in co-ed age-specific activity groups (~14 campers in a group), campers learn and grow as a group. While at each activity, campers will receive individual instruction according to their ability. 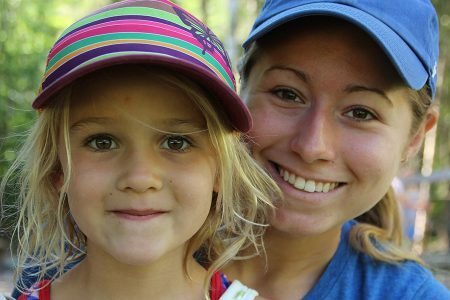 There is no need to sign up for any of these daily activities and parents can rest assured knowing that their camper will experience and participate in all of our camp activities. 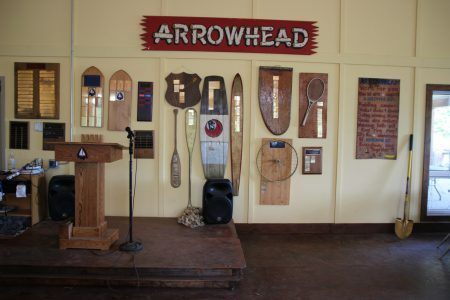 We offer three two week sessions at Arrowhead Camp for campers 6 to 16. During these sessions we average around 115 Campers, 40 Staff and 20 Leaders in Training (LIT). Campers are welcomed to register for more than one session. 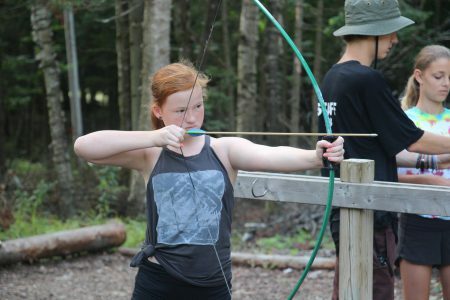 All of our sessions offer unique programs and activities to ensure that campers staying for more than two weeks experience new and exciting adventures. 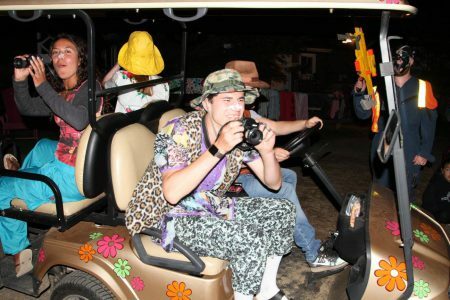 During their stay at camp, campers get to experience a wide range of activities in a safe and positive environment. Traveling in co-ed age specific activity groups (~14 campers in a group), campers learn and grow as a group. While at each activity, campers will receive individual instruction according to their ability. 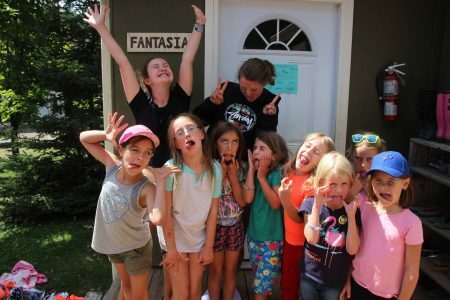 There is no need to sign up for any of these daily activities and parents can rest assured knowing that their camper will experience and participate in all of our camp activities. Safety is a key component of all of our activities. Working with campers, we develop a solid knowledge base and awareness of all of our activities to ensure that these activities are as safe as possible. 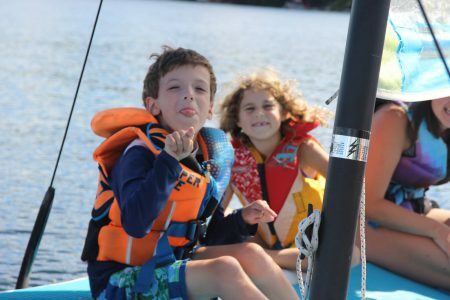 Campers and staff are required to wear personal flotation device (PFD’s) or lifejackets during all of the boating activities. Camp provides safe PFD’s and lifejackets for all campers. 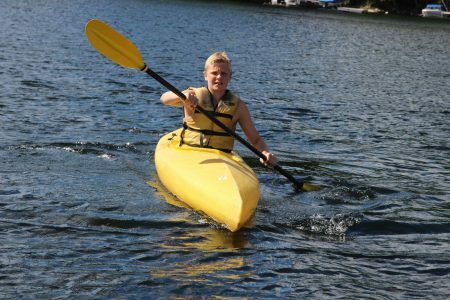 We also provide paddles for the kayaks and canoes. All of our staff are trained to deliver a high quality, safe and fun program. 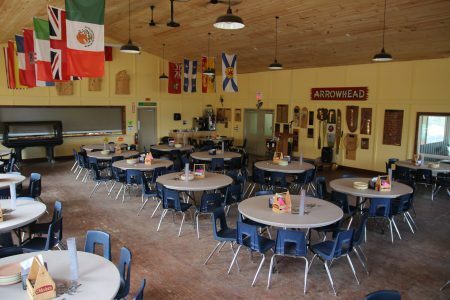 After supper every week day we offer two all camp programs. 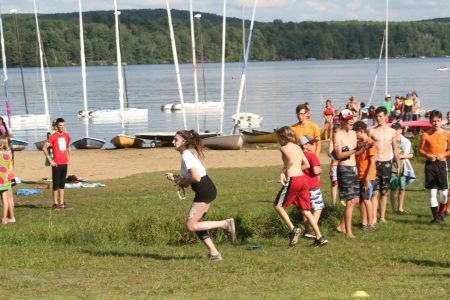 Immediately following supper all staff and campers participate in a high energy wide game, for example capture the flag, rocks, survival etc. At the completion of the wide-games, campers have a one-hour break to get ready for the theme program and visit the Tuck Shop for a treat. 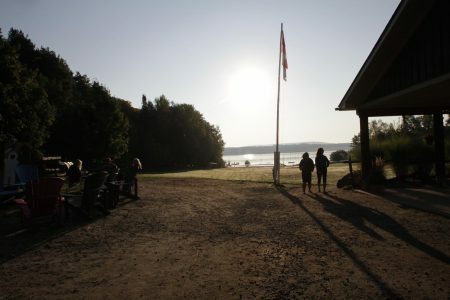 After this break the entire camp meets at the flagpole where the 2nd evening program is introduced. This program is generally a theme and character rich program in which campers of all ages can let their imagination run wild. Saturday’s are All Camp days with the entire day is focused on one encompassing theme. Campers and staff look forward to this high energy and exciting day of activities. On Sunday, we slow the pace down just a bit and campers enjoy this change of pace and look forward to enjoying a more relaxed day at camp. Out of bed sleepy head! Breakfast could include eggs, sausage, pancakes, fresh fruit, french toast and muffins. 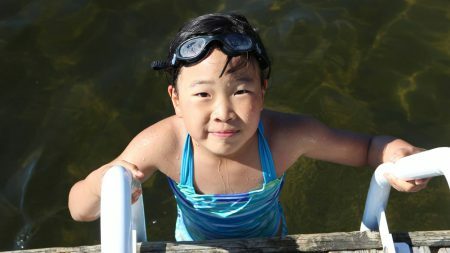 One activity period each day is DOT (Daily Optional Time) when campers can take a shower, write letters or participate in a small group activity. We can show you how to paddle kayak, go kneeboarding or how to fish. Lunch could include soup, chicken burgers, BLT bagels or grilled cheese and soup. We can show you how to go mountain biking, play tennis or learn to swim. We can show you how to go water skiing, wakeboard or shoot a crossbow. We can how you how to shoot an arrow, throw a baseball or how to paddle a canoe. Dinner could include spaghetti & meatballs, stir fry, grilled chicken pizza or hamburgers. For example, Capture the Flag or some other awesome activity. Campers visit the tuck shop to purchase a snack. Typically a theme based all-camp game. Bedtime for younger campers. To cabins for older campers. ** Sunday is ‘Choice Day’. 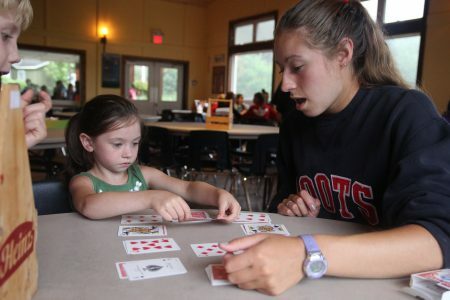 Campers choose from a variety of regular and special activities.